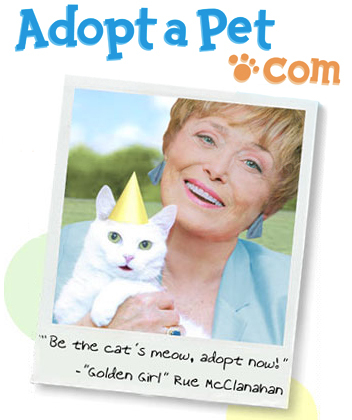 Abbie Moore, executive director of Adopt-a-Pet.com, released the following statement regarding the death of actress Rue McClanahan, whose image appears on the non-profit’s web site: “Everyone at Adopt-a-Pet.com is extremely saddened to hear of Rue McClanahan’s passing. Ms. McClanahan, a noted animal lover, generously donated her time, energy, and likeness in support of pet adoption by appearing in an episode of our web series, The Save-a-Pet Show. She also appears on the Adopt-a-Pet.com web site, fittingly, on the page where visitors can search for a shelter cat to adopt (http://www.adoptapet.com/cat-adoption). We’ve always thought of her as our ‘Cat Ambassador’, greeting and encouraging all who come to Adopt-a-Pet.com with the intention of saving a cat’s life.